May was primary season in Russia. For the first time, some Russian political parties have adopted the American practice of holding primary votes to select their candidates for the forthcoming general election. The idea, supposedly, is to involve citizens more deeply in the democratic process, and to ensure that candidates have popular support and are not just the appointees of party leaders. So, how has it worked out? The file containing logins and passwords of everyone who had taken part in the primaries was posted on the PARNAS website on Sunday afternoon. The data was real and allowed anyone to see full details of any voter – including name, emails and phone numbers, as well as the people they voted for. In consequence, PARNAS has had to suspend all voting. Well known blogger, and one-time PARNAS collaborator, Aleksei Navalny urged the party’s leader Mikhail Kasyanov to resign, and prominent party member Ilya Yashin pointed the finger at Kasyanov’s one time mistress Natalia Pelevina, saying that the leak came from within the party and ‘I have a lot of questions for that woman.’ The scandal has worsened the already great divisions in the liberal camp. Perhaps even more embarrassing for PARNAS than the leak of personal information was the revelation of the total number of voters – about 4,000. The contrast with the 10 million for United Russia could hardly be more striking. 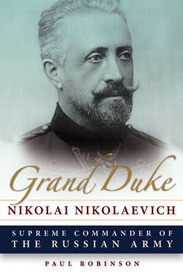 This week’s book is a translation of the memoirs of General A.I. Denikin, leader of the Armed Forces of South Russia during the Russian Civil War. Apologies for the lack of posts this week. It was my 50th birthday on Tuesday, and I have been entertaining family members who came over from the UK to celebrate with me. Normal business will resume in due course. Why did the Bolsheviks triumph? Why did Stalin succeed Lenin? The Tsarist state was weak and unable to cope with the strains of the First World War. The Bolsheviks didn’t triumph because they had majority support (they didn’t), but because they were more determined, more organized, and more ruthless than their opponents. Stalin’s ascent was inevitable. Rather than distorting Lenin’s legacy, Stalin carried it to its logical conclusion. As the saying goes, even a stopped clock is right twice a day. In this Tuesday’s Power Vertical podcast, REF/RL’s Brian Whitmore noted that some of the people who phoned into Vladimir Putin’s recent televised question and answer session have ended up worse off as a result. For instance, after workers of a fish processing plant complained to Putin that they hadn’t been paid, government inspectors descended on the plant and laid criminal charges against its management. As a result, the plant is on the verge of bankruptcy and the workers may lose their jobs. Whitmore says that the case shows that Putin ‘seems powerless’ to fix even small, local problems, and that this is a sign that the Putin system ‘is breaking down’. Where I would agree with Whitmore is in recognizing that despite all the talk about Putin’s autocratic power, in reality the Russian president’s ability to influence events within Russia is highly circumscribed. What Whitmore gets wrong is in believing that this is somehow a new phenomenon and an indication of a system on the verge of collapse. In fact, it is a problem which has been endemic to Russia for centuries, and which Putin himself has complained about for years. Putin’s repeated calls for de-bureaucratization reflect a belief he expressed on 18 December 2012 that, ‘The less bureaucrats interfere in decision making, the better’. Many of Putin’s predecessors shared his frustration with his inability to get the Russian state to bend to his will. They addressed it in different ways. Stalin’s approach was to try to bulldoze his way through opposition, if necessary by arresting and shooting public officials who appeared to be resisting his will. Gorbachev tried a different path – faced with what he considered bureaucratic resistance to the economic reforms of perestroika, he decided to put public pressure on recalcitrant officials through means of glasnost, and when that still didn’t work he attempted to bypass them entirely by democratizing the Russian political system. Stalin’s approach was only partially successful and came at a huge cost. Gorbachev’s was a disastrous failure. Putin’s is a bit more subtle – while retaining control of the political system, he has sought to co-opt civil society by means of the Public Chambers and the All-Russian Popular Front, institutions which bring together nongovernmental organizations, businessmen, and political activists to cooperate with the Russian state in pursuing each other’s objectives. Putin has also to some extent reverted to the style of Russian Tsars, trying to get around the bureaucracy by appealing directly to the people. But the fact that he continues to express his frustration about alleged bureaucratic resistance suggests that he has not been very successful in overcoming it. Part of the problem, I think, may be that bureaucratic resistance isn’t the main problem. That does not mean that it does not exist, but sometimes there may be good reasons for it, or there may be other factors which determine why centrally-dictated policies are not achieving their goals. The failure of Soviet industry to meet its targets wasn’t due to sabotage and couldn’t be solved by shooting managers – the targets were unrealistic and the entire system of central planning inherently inefficient. The failures of perestroika owed more to the ill-conceived nature of the reforms than to actual resistance. And, if nowadays fish plant workers aren’t being paid, it is probably because their plant isn’t profitable. Sending in government inspectors isn’t going to solve that. In other words, although a recalcitrant bureaucracy provides a useful scapegoat for government failures, in fact inappropriate policies and ignorance of local conditions by the central authorities are probably more important. I suspect that Putin will still be complaining about the bureaucracy right up until the day that he finally leaves office. 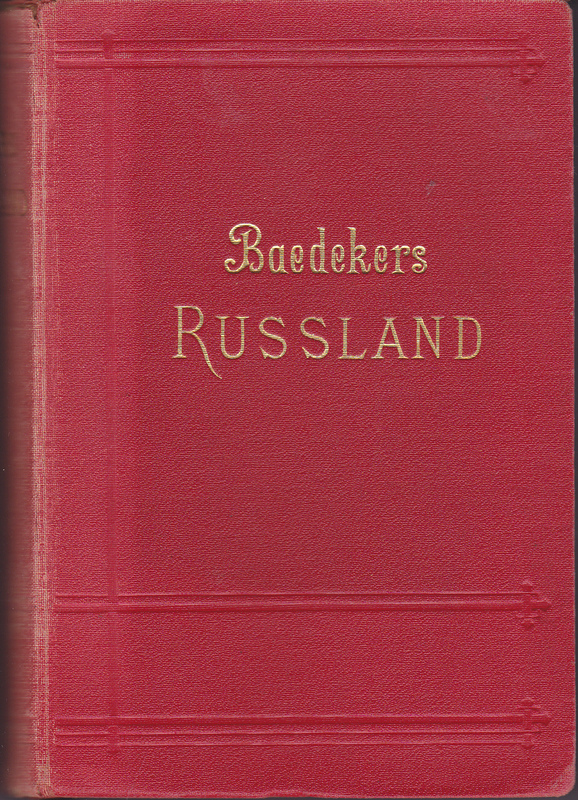 This week’s book is a 1912 Baedeker guide to Russia. 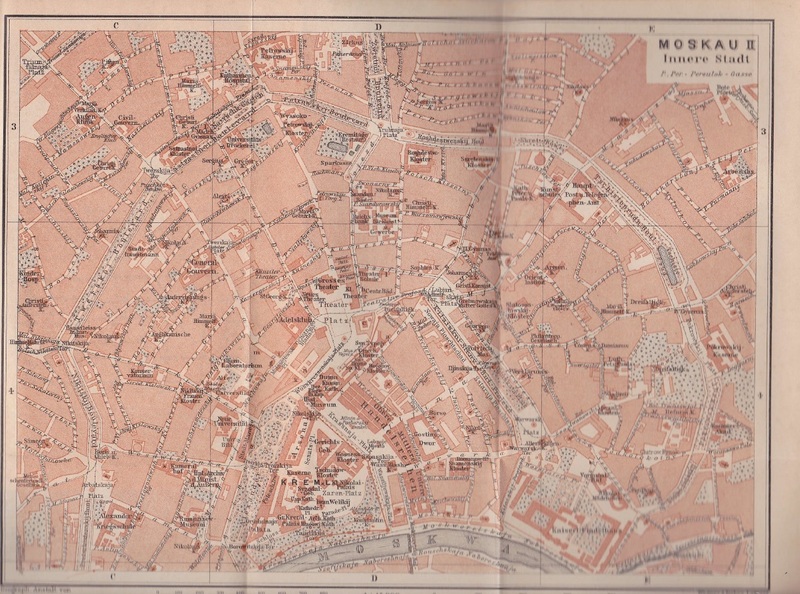 I have also scanned the map of Moscow which is between pages 284 and 285. The Ivan Ilyin bandwagon continues to gather passengers. The latest on board is historian Timothy Snyder, who delivered a lecture last week to the Watson Institute at Brown University in which he sought to explain Russian foreign policy through an analysis of the philosopher’s writings. The lecture promotes a familiar theme, namely: Vladimir Putin cites Ilyin; Ilyin was a fascist; therefore Putin and the regime he leads are fascist. Needless to say, I have a few problems with this, and Snyder’s lecture forces me to return once again to the topic of ‘Putin’s philosopher’, even though it means repeating myself somewhat. Snyder begins his talk by saying that Russia’s problem is that it isn’t a real state, in that it has not worked out a system of succession of power. Instead, its leaders have deliberately chosen to falsify elections and leave Putin in power almost indefinitely. At the same time, Snyder sees the war in Ukraine as an effort to break up the Ukrainian state and prevent the European Union from becoming a state. To explain Russian behaviour, therefore, Snyder suggests that we need to find ‘an idea which is comfortable with the lack of a state’ (11.00 minute point in speech). That idea is ‘fascism’. Thus Snyder argues that it is no coincidence that the war in Ukraine has coincided with the revival of ‘a fascist geopolitical thinker’, namely Ivan Ilyin. My purpose here is not to defend Ilyin. I’m personally of a liberal and democratic inclination. Instead, my concern is the overly simplistic theme espoused by Snyder and others: Ilyin = fascist, therefore Putin = fascist, therefore we all need to be very scared. In my last post, I said that the ideas of Eurasianism and Alexander Dugin were just several among many influencing Russian policy makers, and even then in a highly bowdlerized way. The same could be said of Ilyin’s ideas. It’s highly debatable whether Ilyin is really as influential as Snyder makes him out to be. But even if I’m wrong about that, Snyder presents only a fraction of what the philosopher’s ideas are all about. It is indeed true that Ilyin said some positive things about fascism. But he was hardly alone in a lot of this. Winston Churchill, for instance, praised Mussolini in a 1927 speech, saying that fascism ‘has rendered service to the whole world’. Franklin Delano Roosevelt called the Italian Duce ‘that admirable Italian gentleman’. And David Lloyd George described Hitler as ‘a born leader of men, a magnetic and dynamic personality with a single-minded purpose, a resolute will and a dauntless heart.’ But we don’t generally call them all fascists. Moreover, although he supported authoritarian rule, Ilyin was simultaneously a trenchant opponent of all forms of totalitarianism, which he described as ‘godless’. And contrary to Snyder’s depiction of Ilyin as an anti-Semite, the Nazis actually dismissed him from his job teaching in Berlin for refusing to preach anti-Semitic doctrine. In the end he had to flee Germany. If Snyder is right that fascists are happy with a lack of proper states, then Ilyin can’t possibly have been a fascist since the establishment of a strong, law-based state was one of his most strongly expressed principles. Ilyin placed an extraordinarily high importance on the law and on the development of ‘legal consciousness’ (pravosoznanie), things which are quite incompatible with fascism (which Snyder admits is associated with ‘arbitrariness’). Ilyin also repeatedly said that the state must be limited, that it must not intrude into people’s personal lives, and that the people must enjoy freedom of religion, speech, and assembly, and so on. Rather than saying that everything was somebody else’s fault, in his book On Resistance to Evil by Force Ilyin emphasized that those who fight an external evil have to accept that they are themselves partially responsible for it. Bolshevism, he wrote, was merely the external manifestation of the internal spiritual failings of the Russian people. He did not, as Snyder claims, say it was something imposed on Russia by the West (although he certainly viewed Marxism as a Western, not a Russian ideology). Next, when you look at the bits of Ilyin which Putin has quoted, they are definitely not the more authoritarian ones. In 2005, for instance, Putin cited comments by Ilyin about the need to limit state power; and in 2014 he cited a statement by Ilyin about the importance of freedom. In an article entitled ‘The Complex Legacy of Ivan Ilyin’, American scholar Philip Grier describes the philosopher’s thought as being often ‘paradoxical’. Snyder, however, seems to prefer simplicity to complexity, and so misrepresents both Ilyin and modern Russia. Clearly, Ilyin wasn’t a pro-Western liberal democrat, and if you think that Russia ought to be a pro-Western, liberal democratic nation, then Ilyin is not the philosopher for you. But it’s a step too far to go from there to saying that current Russian foreign policy is fascist in orientation.